hello! I want to ask you if you'll post an schematic of the Death by Audio Harmonic Transformer. I'm looking for this layout. COuld you tell something? Thanks a lot! I haven't seen a schematic for it, but I'll have a look around. If you or I can find the scheme anywhere then I'm happy to do a layout. i'm the same. i changed my mail. Send it to guitarfx@hotmail.co.uk and I'll see if I can make anything of it. hello! i just finished bread boarding this and sounds really sweet (thankyou)! however... just say i have channel 1 on.. so then I push the second switch to turn both on at once which works, however when i press it all sound cuts out for about a second then comes back in working. So i was wondering if you knew what a possible problem could be? Hi Louis. I haven't heard of that happening before, but having said that I haven't really been involved in many discussions about the Super Duper so I could have just missed it. 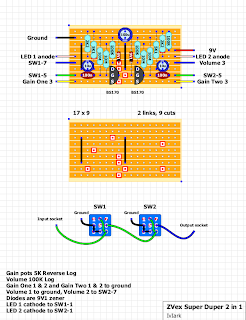 Have you wired up the stomp switches as I've shown? "just in case anyone's wondering, the super-duper 2-in-1 has two super hard-ons inside of it. the second one has a master volume control that replaces the tie-down output resistor in a standard super hard-on, but when that master is turned up all the way, both channels are precisely the same as a super hard-on. okay, that's a lie. there is one teeny-tiny difference. the super hard-on's input frequency response is 0.3 Hz to 100kHz. i was forced to limit the super duper's frequency response to 3Hz-100kHz because when i left all that near-DC response in there, the unit would nearly shut down and go silent for half a second with both gains cranked all the way if you hit a hard chord. but what's a couple of Hertz between friends?" This was put together from an inferred schematic, so I'll see if I can have a look at the real thing to check any other differences. aha! great news.. i have no idea what i did (pretty sure i bumped something by accident) and it works! might have something to do with dodgy connections from the switch since i am using crocodile clips. thanks anyways! ill try taking out the 100k resistor but it sounds fine. cannot ruin the spaceship! sorry to be a pain but ive just soldered everything together and the switching problem has come back. i re-soldered nearly every connection i thought was dodgy but yeah to no avail. tried everything!i could live with it but still a bit frustrating... any ideas? Thanks for creating this layout. Is this a direct clone of the original super duper 2in1 ? I have been looking for a faithful schematics for a long time. I don't know to be perfectly honest with you Rob. It's from a schematic on FSB, but I don't know if it's for a current or older version of the effect. I built this one yesterday and it works properly so you can VERIFY it. IMO, when the drives are turned up to clip alot, its distortion is a bit too one dimensional for me, but if used as slight boost/overdrive it's not too bad. Cool thanks John. I used to be a real fan of the SHO but I find now that it makes things just a bit too glassy for me. I do like it with the gain right down though so it's just like a buffer with an extra little bit of sparkle to the top end. My name is Joshua, I'm an Australian living in Indonesia. I have just come across your website and decided to build the SHO. I used the BS 170 MOSFET and then for an experiment I substituted a BC 239 which worked equally as well. This morning I decided to have a go at the Super duper hard on but I am having a bit of trouble wiring up the switches. I am using DPDT switches similar to the Carling switch with only 6 prongs. 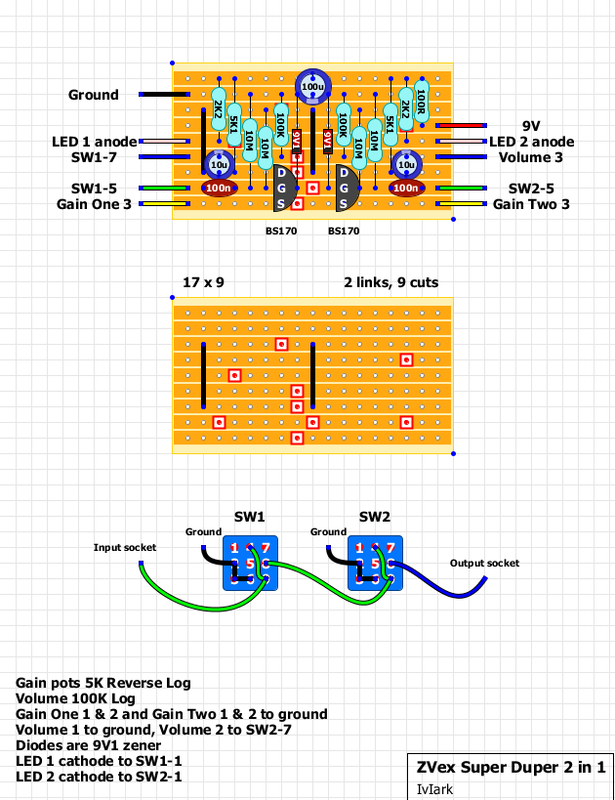 I have never build an effect with two foot switches before and don't know how to wire this up as the diagram only shows the wiring for switches with 9 prongs. I was wondering if you could possibly steer me in the right direction or even better send me a diagram? Just use the middle and right hand pole, ignore lugs 1 to 3 on the layout (which are only used for the LED indication). So the ground connection will just go to lug 6. Sounds FANTASTIC! Thanks for the layout. And on your picture, is this the component side view? You make the solders on the over side? Thanks for the layout and for your help! All grounds need connecting together so choose appropriate places, the input and output sleeves are probably a good place, just make sure they're all connected without creating a ground loop. And yes the layouts all show the component side, so when you cut the tracks you'll need to mirror the layout to see exactly where the cuts will go. Thanks for your answer! Very quick! Hey, Mark, I don't have a 5k reverse log pot in my toolkit, but read somewhere that you can bridge the wiper and ground on a 100k linear pot, to create a 5k log pot. I couldn't fully understand how to do this. If you are feeling charitable, please clue me in to how this kind of thing works. Built this guy up worked fantastic! I bought an enclosure a little bigger and with an extra hole for a tone knob. Wired in a stand alone passive tone control to help scoop some of those lows out a bit when the pedal is driven pretty hard. It's a beast! i'm officially in love with your layouts. So should the second 100k resistor be left in there or ommitted?? Its looking like the schematic online is leaving out the second 100k....any info please. Looking at schematics, shouldn't each diode go from Source to Gate of the transistor? It really isn't significant though, the zener is only there to protect the mosfet from static electricity and it doesn't affect the sound. Zach posted in TGP that he decreased the 100nF caps to 10nF when he went from SHO to super duper to sliiiightly reduce those really low frequencies and the "shuddering" that happens when you hit a heavy chord. I built two identical SHOs and ran them into each other and got the weird quietness/shuddering when I hit a chord or moderate to heavy playing. Going to try the changes and see what happens. Ive been wondering if he only changed the input cap on the first stage of the boost. My buddy has got one from zvex and he swears the 2nd stage sounds fatter. Ive been wondering if maybe that was the cause of this. In this gutshot you can see that the caps are marked 103, meaning that in super duper he used indeed 10nFs instead of 100nFs. I sometimes have the "shuddering" problem so I'm gonna try those 10nFs. btw, lowering the 100nF caps really helps the "shuddering" but you don't have to lower them all the way to 10nF. Sorry to keep posting, but I have been wondering if anyone has had much problems with switch popping...Doesnt seem like you really need to add a 1m on the input because it already has the 10meg in the same spot...any ideas anyone? If you mean the 10M from Q1 (or Q2) gate - That isn't helping the switching as there is 100n cap before it. So just to add what I found in my build...I used 1m pulldown resistors like I usually do on my builds and it still popped loudly. After I took them back out it didnt pop much at all. I was reading on the ZVEX site where someone was complaining about the small pop and he said he could put a pulldown resistor in it but it would kill the high end sparkle sound it gives. I used a .01uf on the 1st stage input, and a .1uf on the second stage input. The 2nd stage is a little fatter than the first which is nice, and I can crank both gains to max without having the pedal cut out for a second like others have mentioned. Just wanted to share my findings (; Oh and I left out the 100k output resistor on the second stage, and yes it killed the awesome symmetrical spaceship look it had going. Firstly just to let you know how I am absolutely blown away at how accessible you have made seemingly inaccessible pedals. THANKS. Its been the topic that I have bored everyone for months with and I haven't cared if they were listening or not. Just built my first Zvex super duper ( as per your layout with the 100k Resistor in place) and side one works great but side two does nothing ( if anything it dulls the sound)and the LED comes on but very dim. I was thinking maybe I have blown a transistor... but Im new to this so any help would be great. The BS170s are easily damaged by static so that would be the first thing I would check. First check the voltages you're getting at the BS170 pins to see how the two sides compare. I changed the transistor and there was no change. but what I realised is that when using plastic jack plugs ( as I have ) I need to run a ground from jack to jack - this lit up the led properly but no change to sound. I now feel the problem may be down to my off board wiring. I have used a stereo in and mono out jack (both plastic enclosures)wiring all grounds to the input jack sleeve ( I haven't used the ring as I haven't used a battery) and linked the input sleeve to the output sleeve. excuse me for my novice ability in advance, but can you see anything wrong in what I have done? I didn't install a resistor before the LEDS as I assumed that this was catered for on the board - is this a correct assumption? also, just out of curiosity I have arranged the two BS170'S in the same orientation as shown in the vero layout, and noticed that you have mentioned elsewhere that this is not always correct on all layouts. Is it correct on this layout? I am experiencing an issue with this build. The input side works well. I am also able to get a bypass signal. When the second boost is engaged by itself it seems to work, but whenever switch 1 and 2 are both engaged together, then i have no signal. Im very confused. Any help would be appreciated. Cheers. I built one according to the information here, however, I get the popping sound when I engaged the 3pdt switch. I read about the pulldown resistor information above, I am sorry that I do not really understand how to get the 10M resistor connected. Is it one end of the 10M resistor connected to the ground and what about the other end of the 10M resistor be connected to? Many thanks. Sigh, a frustrating build for me.. I made sure everything was placed and wired correctly. Hooked everything up and: Nothing unfortunately. Too obsessed with the synchronizing maybe, I realized I forgot the 100R resistor. That in place, I fired it up again. It does have sound, but really low volume. The Crackle is loud when turning, but the signal very low. I was afraid I may had fried something by missing the resistor, so, I probed it. When only looking at Switch/side 1, i have normal signal until after the second 10m resistor (next to the bc170). The bottom part has clear signal (as does the G of the transistor), but when i trace that to the top of the bridge on the far left, the sound is very low and distorted. Does anyone know what I did wrong? Both channels don't have volume separately either. What did I probably screw up? Hi, I've build this pedal about a year ago. Works fine and I love it. But in a short time one trasistor broke down twice. I saw on zvex website that transistor B170 is very sensitive and that they installed a protection circuit. Has this vero a protection? hi. What diode may I insert to this pedal instead 9v1? At this moment I have diodes 1n4148 and zener diodes 1n4733a (5,1 v) What is better. (: Thank You. I've got the "Vexter" version of this pedal (purchased before I discovered this site) and it's got several small differences from the layout above. As a newbie I'm not sure how significant they are, but interesting either way. If anyone is interested in them, I can post under one of the forum topics. I've revived the thread in the Open Chat area under the subject "Super Duper Build Problems." (It seemed like the most appropriate spot, considering the alternatives.) Currently just listing the differences numerically but can add gut shots and crappy diagram/schematic upon request.